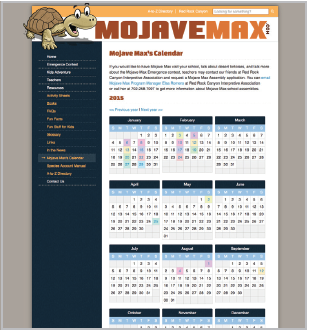 Clark County Desert Conservation Program (CCDCP) and its partners needed a modern interactive website with a new brand style to teach people about native desert species, and how to safely explore, protect, and enjoy the local desert environment. 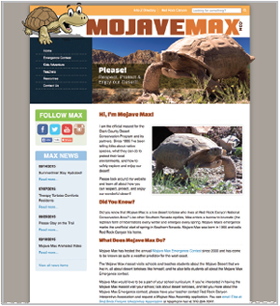 Mojave Max is a desert tortoise who is used as a vehicle for training school age children as well as the general public. 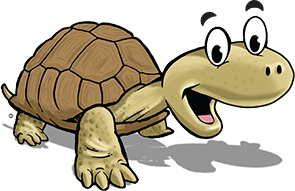 Every year the Clark County Desert Conservation Program holds a contest for people to guess the date that Max will emerge from his brumation. Zee Designs determined the best way to reorganize their content, showcase the content with a new brand style, offer their staff a way to edit their content in a sophisticated CMS, and engage their website visitors. Play an interactive game to find and learn about all the plants and animals in a desert landscape photo. In addition, CCDCP were looking for a way to engage children and requested Zee Designs to develop a custom solution. 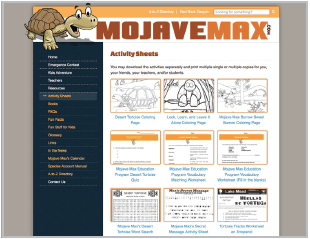 Kids Adventure is an educational activity “sheet” where children (and adults alike) can explore Mojave Max’s desert home and identify exciting plants and animals that are important to maintain a balanced ecosystem.